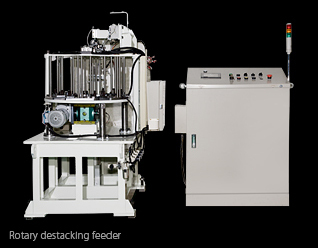 There are times when existing press machinery options just don`t fit your productions needs. Sometimes existing specifications are just excessive, or don`t create the right cost or production performance. When this is the case we listen closely to your production demands and create and deliver equipment optimally customized for your factory. 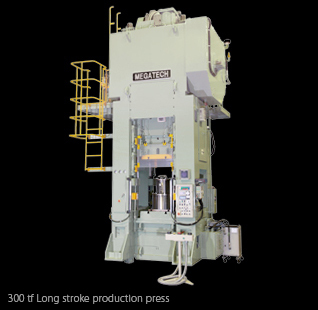 Just a few examples of the custom machinery we have built and delivered. 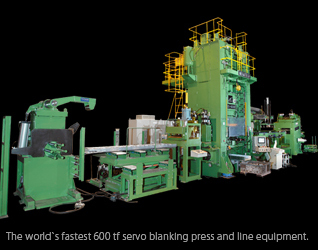 The world`s fastest 600 tf servo blanking press and line equipment. The list of customized machinery goes on and in each case the end customer has expressed their satisfaction with every aspect of Megatech service, design, creation, and installation. Even if you are just in early planning stages and considering what type of equipment best suits your production needs, get in touch with us, and our capable staff can help you discover the plan that best suits your needs. In some cases it may be that an already existing machine can be modified to suit you, or it may be that a fully made-to-order machine will give you the best all around performance in the in the long run. Whatever the case may be, our experts are always happy to listen and give their advice.